Over the past two years, an enormous amount of time and energy has been devoted to determining the essential steps for revitalizing the Downtown into a people friendly heart of the community, which provides a unique experience for residents and visitors alike. The National Main Street Centre provided a model for Downtown revitalization that has worked in 1500 communities across North America. Downtown Nanaimo is the heart of the city, a people-friendly and unique place because of the harbour and the history evident in heritage sites, events and the physical design of downtown. Downtown attracts residents, businesses, government, professional services and tourists because of its beauty, spectacular waterfront, excellent transportation links, arts and culture events and facilities, culinary attractions, diverse shopping, and lifestyle opportunities, all within a positive and strong economic environment. Create a stable investment environment for recruiting businesses into the Downtown. A strong Downtown partnership has been created between the Nanaimo City Centre Association (NCCA), the Old City Quarter Association (OCQA) and the City of Nanaimo to implement the three strategies using the prioritized Action Plan. An agreement in-principle has been reached for the partnership to function as the Downtown Action & Advisory Committee (DAAC) with the signing of the agreement to occur at the Celebration at the Arts Centre around 5:30 p.m. Membership from the three partners has been ratified with the following representatives nominated by their respective organizations: Bob Moss, Blake McGuffie and Art Crape (Nancy Mitchell - alternate) from the NCCA; Eric McLean and Jennifer Rollison (Carol deBeeld - alternate) from the OCQA; and Councillors Ron Cantelon, Tom Krall and Doug Rispin from the City of Nanaimo. Three members-at-large were also selected: Camela Tang, Jerry Pink and Denice Barrie. The next steps include hiring a Downtown Executive Director. This job has been posted and selection is underway. The Downtown Action and Advisory Committee will then determine, establish or confirm the mandates of sub-committees which will work to implement the Action Plan. A Downtown storefront office will be opened to spearhead revitalization efforts. The Terms of Reference for Phase I of the Business Recruitment Project for the Downtown has been posted with the competition closing 2001-May-28. Great progress has been made towards Downtown revitalization over the past several months through the hard work of many volunteers and Downtown stakeholders. Downtown revitalization efforts continue with opportunities for communication and involvement. The purpose of this site is to provide information on the City's heritage policy and building inventory. 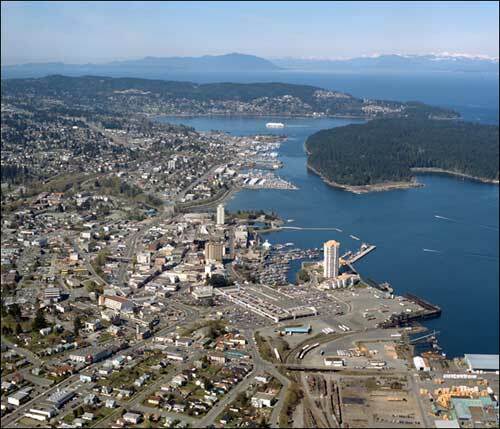 In addition to this information, the site also contains a chronology of historic events and an outline of Nanaimo's historical development. Both sections provide a concise understanding of the City's development history and provide a context in which to place the building inventory. Finally, information on the Nanaimo Community Heritage Commission is also accessible, including contact information for the City's heritage planner. New information of relevance to heritage conservation in Nanaimo will be added in the future as time and resources permit - so please check back often. The City of Nanaimo's current heritage building inventory was completed in 1998 as part of a larger project, the Nanaimo Heritage Action Plan. This integrated project identified the significant historic resources in the city, and proposed a management framework for their future conservation. The inventory outlines the history and significance of individual sites. Additional information on individual resources may also be found in the inventory files, and in the Nanaimo Heritage Inventory Technical Report. The management recommendations may be found in the City of Nanaimo Heritage Action Plan report. Copies of this information can be retained by contacting the City's Heritage Planner. The 1998 inventory adds to the scope of several previous inventories that date back over twenty years, and adds many newly identified resources. There were a number of previous inventory projects, including fieldwork undertaken in the 1970s for the Canadian Inventory of Historic Buildings, that in total identified over 500 sites. Lists of identified sites were consolidated, and other resources identified through background research were added to this list. A public nomination was undertaken, whereby the community at large was invited to submit addresses and information for consideration. Existing historical information was surveyed for relevant data regarding settlement patterns and background on specific persons and buildings. Other pertinent research sources were also identified at this point. The general history of the city was traced, and major transportation routes identified. All of the identified sites were surveyed. To ensure that significant resources had not been missed early transportation routes in all areas were examined. Many of the previously identified resources were found to be altered or demolished. Those resources chosen for further study were photographed, and an inventory form was filled out that gave a physical, structural and contextual description of the resource. The buildings identified in the field survey were then more fully researched to identify their historical importance to the community. Municipal and archival records were examined that allowed for consistent and accurate identification. The most useful records were those held in the collection of the Nanaimo Community Archives, and the Tax Assessment Rolls from 1875, held by the City of Nanaimo. Other research sources that were consulted included relevant B.C. Directories from 1886, previous research conducted for the Canadian Inventory of Historic Buildings, historic photographs and maps located in the Provincial Archives of B.C., the Vancouver Public Library Historical Photographs Division, and the City of Vancouver Archives. All of the information from these listed sources was then combined to provide the historic background for each listed building. Much additional historical information of general interest was unearthed during this process, and the status of a number of sites was reconfirmed. The completed inventory forms were then assembled as an inventory master report for further reference purposes. Style/Type: Is the building's style representative of the city's significant development periods; or a building type associated with a significant industrial, institutional, commercial or transportation activity? Design: Does the building have notable or special attributes of an aesthetic or functional nature? These may include massing, proportion, materials, detail, fenestration, ornamentation, artwork, or functional layout. Construction: Is the building constructed of unique or uncommon building material, or is it constructed using an early or innovative method of construction? Designer/Builder: Did the buildings architect, designer, engineer and/or builder make a significant professional contribution to the city, province or nation? Historical Pattern: Is the building associated with broad patterns of local area history, including development and settlement patterns, early or important transportation routes, ecological or geographic change, significant landforms, or social, political or economic trends? Landscape/Site: Are there intact historical landscape or landscape features associated with the building; or a notable historical relationship between a building's site and its immediate environment, including original native trees and topographical features; or a notable use of landscaping in conjunction with an existing building? Neighbourhood: Does the building exhibit continuity and compatibility with adjacent buildings? Visual/Symbolic Importance: Is the building a landmark structure; does it have value to the city or a local area or neighbourhood? Has the building been modified or altered since its original construction? Updates to the inventory are periodically recommended to Council by the Heritage Commission. If you would like to nominate a building, site, structure, landscape feature or other historic resource for placement on the inventory please contact the Heritage Planner at (250) 755-4429 or pick up a nomination form from the Development Services Department, City Hall Annex, 238 Franklyn Street, Nanaimo, B.C. An elected Council comprised of a Mayor and eight Councilors governs the City of Nanaimo. Councilors are elected for three-year terms and each member of Council represents the City at large. The Local Government Act gives Council the authority to set budgets, levy taxes, and establish policies to guide the growth, development and operation of the City for the benefit and protection of its citizens. The powers of the Mayor and Council are exercised through the adoption of resolutions or the enacting of bylaws at regularly scheduled Council meetings. See our tentative meeting schedule for the list of upcoming meetings. Open Council meetings are held biweekly, Monday evenings at 7:00 p.m. in the Council Chamber at City Hall, 455 Wallace Street. The rules governing the conduct of the meeting are outlined in the Council Procedure Bylaw and Robert's Rules of Order. Members of the public are welcome to attend the open meetings of Council. The public can address Council at these meetings if arrangements to do so are made ahead of time.